Marques Tuiasosopo has accepted an offer to coach tight ends at USC. USC Coach Steve Sarkisian has already hired three former Washington assistants, and he is apparently adding two more. Marques Tuiasosopo has accepted an offer to coach tight ends at USC, the Seattle Times’ Adam Jude reported Sunday night, citing multiple unnamed sources. USC also is expected to announce the hiring of defensive coordinator Justin Wilcox, Jude reported, citing sources. 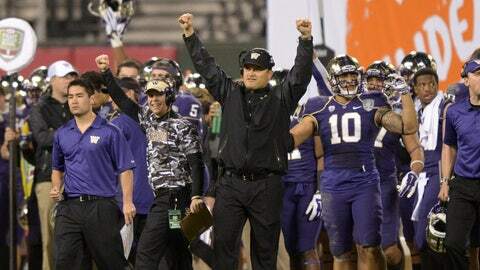 Tuiasosopo was Washington’s quarterbacks coach last season and was the Huskies’ interim coach for their Fight Hunger Bowl victory over BYU on Friday. Wilcox would replace Clancy Pendergast as defensive coordinator. Sarkisian hired Huskies assistants Johnny Nansen, Keith Heyward and Peter Sirmon earlier this month. Trojans offensive coordinator Clay Helton and receivers coach Tee Martin have been retained by Sarkisian.